The world keeps changing from moment to moment. The THIRDWAVE desires to deliver new discoveries to many through the expertise we have cultivated as an IT business. That is our challenge as the best partner! THIRDWAVE aims to be the pioneer of the information revolution. The company's name THIRDWAVE originates from Alvin Toffler's The Third Wave, signaling the coming information age society. Since the establishment of our company 20 years ago, we have been growing with the advancement of PCs. Recently however, the Internet has increased the acceleration of the information revolution. Moreover, our corporate philosophy is "Developing people and developing value is the key to contributing towards society". PCs are an open and scalable system. Users have the opportunity to build on as they desire, making for endless possibilities. With our DOSPARA stores spread across the country, we stock an abundance of our personal computer house brand Prime, do-it-yourself kits, servers, PC parts, and accessories, and we give first priority to providing technological advice and after sales service. Internet usage has been positively promoted up until now regardless of whether it is within or outside of our company. A wide range of services are provided on our homepage, these include an automated estimating service for our PC house brand Prime, sales information, latest product information, latest technological information, as well as online shopping. Moreover, a variety of services are offered via bulk email to DJ Club members. Our desire is to continue progressing with the Internet in relation to multimedia and broadband. The PC industry has changed greatly over the last 10 years. 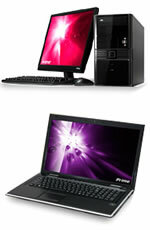 Customer demands have also diversified with the evolution of the PC. We have handled our specialized product rather than the no. 1 products to satisfy our customers as well as responding to their individual needs. Of course, changes that exceed our imaginations await us over the next ten years. Our aim is to be a company needed over the next 100 years by responding to our customer's desires. If the company is stable, customers can visit with confidence. Employees are also motivated having a sense of security. THIRDWAVE believes that this is the first step in our contribution to society. Company Name DOSPARA Co., Ltd.
Company Name Thirdwave Diginnos Co., Ltd.
1984 The company’s main purpose being to sell computer related equipment. Opened a computer retail store in Akihabara Electric town, Tokyo. 1988 Began a PC rental business. 1992 Stores named DOS/V Paradise, began selling DOS/V computers. 1993 Launched DOS/V Paradise nationwide, including Akihabara in Tokyo and Osaka. 1994 Established an affiliated company and began a used computer buying and selling business. 1998 Major branch stores including Akihabara, Osaka, and Nagoya began operating a mail-order business. 2000 DOS/V Paradise expanded to 24 stores nationwide. Opened a Website to provide Internet communication sales and integrate the mail-order business. Established the Corporate Division deployed in two districts, Tokyo and Osaka. 2003 Store name changed from DOS/V Paradise to DOSPARA. 2004 Nagoya Business Division, deployed within three of the country’s districts. 2007 DOSPARA expanded to 34 stores deployment throughout the country. 2008 Established a series of affiliated holding companies. 2009 Established a branch store in Taipei, Taiwan. 2010 Consolidated the number of nationwide stores to 23 by unifying neighboring stores and enlarging them. 2011 Opened Japan's largest PC parts store in Akihabara, DOSPARA Parts Pavilion. Up until now, the THIRDWAVE Group has worked positively towards reducing risks to our global environment with activities such as energy reduction and developing our used goods business. Since 2010, we have produced an Environmental Report clarifying our approach and its affects. The THIRDWAVE group promises to recognize the company's responsibility to improve environmental issues and to conduct business in a manner that respects the global environment. The THIRDWAVE group recognizes that the protection of the global environmental is a key challenge for the company and therefore designates environmental management activities as a major and important task. The environmental management activities based on the following policies is promoted in order that the THIRDWAVE Corporation may decrease the burden on the environment through all the company's sales activities that include the sale of personal computers and accessories, the goal is to become an enterprise that may be a model in respect of environmental measures. 1Our activities and their effect on the environment is constantly monitored, decreasing the burden placed on the environment is strongly promoted as we aim to continually improve our environmental management activities. 2Reviews are regularly executed based on the policies and purposes provided in the environmental activity report and we are continually working towards setting the appropriate policies and purposes. 3The laws, ordinances, and agreements concerning the environment and other claims postulated are observed. 4Based on the impact of the company's activities on the environment the following items are promoted as a management theme. 4） Promoting the reduction of waste created through conducting business activities as well as recycling. 5The aim is to continually improve the established environmental practices and personnel training provided according to the policies from within and outside of the company. (c) THIRDWAVE Corporation All Rights Reserved.